Shirley Louise Kocian, 74, of New Caney, Texas passed away on Wednesday, June 20, 2018 She was born on Monday, October 11, 1943 in Houston, Texas to Anthony and Ollie SoRelle Santamaria. 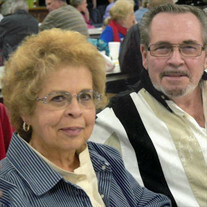 Shirley was preceded in death by her father Anthony Santamaria and step father, George W. Mixon. Left to cherish her memory is her loving husband of 37 years Bennie Kocian; mother, Ollie Mixon; son, William J. Wagner Jr.; step daughter, Michelle S. Simon; brothers, George A. Mixon and partner Mario Alvarez; along with numerous other loving family and treasured friends.